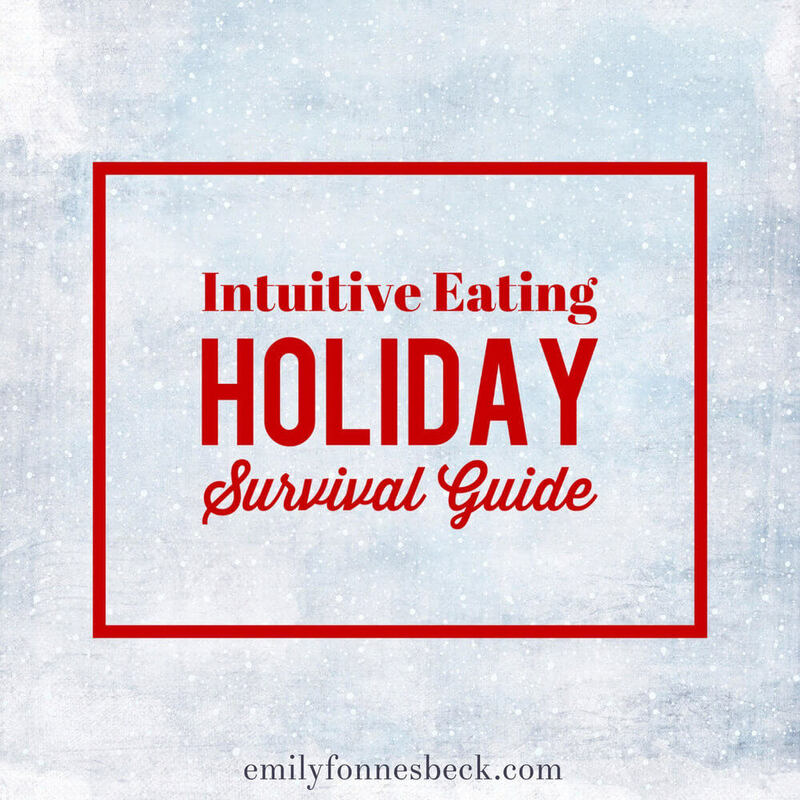 I originally planned to do an Intuitive Eating holiday season support course, but as it turns out, we are traveling quite a bit this holiday season and I didn’t think it was smart to take on another project. But, I still want to help those who need it in some way, especially since the holidays can feel really anxious for those who struggle with food. I’m going to paint some broad strokes in this blog post, and hopefully it gets you thinking about how to best support yourself the next few months. I’m placing extra emphasis on the key points by putting them in all caps. I’m not yelling at you, just making strong recommendations. Well except for the first one, I am yelling that. Permission to enjoy a variety of nourishing, satisfying and traditional foods during the holidays and beyond. Make the holidays meaningful and memorable in many ways, not just as they relate to food. 1. Unconditional permission to eat. If you have rules and judgments around food (good vs bad), it will likely hinder your innate ability to self-moderate food choices. If you know that a diet, restriction or deprivation is around the corner, it will influence how you behave around food. If January 1st is named the day you’ll start a diet, you’re going to throw all caution to the wind over the holidays. Might as well enjoy yourself before the suffering begins, right? SO DON’T MAKE PLANS TO DIET ON JANUARY 1st. The good news is that you can enjoy satisfying foods any day of the year, so there is no need to get it all right now. Eating for the intent to feel satisfied is your key, especially since overeating or under eating are not satisfying (more like uncomfortable or painful). That is probably the hardest concept of Intuitive Eating to grasp. For so long you’ve likely had a system of checks and balances. In other words, eating has been conditional. “I can eat that if I run an extra few miles tomorrow”. “I can have that but only on my cheat day.” “If I eat that, I can’t eat later.” And so on. It can feel really rebellious and wrong to allow yourself ice cream for no other reason than it’s a Wednesday afternoon and it sounds good. The worry is that once you do you’ll lose control. However, controlling food is actually a false sense of control. The food is controlling you, not the other way around. 2. Which brings us to another point – structure can help you feel a bit more in charge. Perhaps honing in on hunger and fullness levels will give you something to help guide eating patterns. That is not meant to become another rigid diet rule, but it can make the transition from all the rules to no rules much easier. Try to tune into your body and trust the structure and rhythm it already has. Our bodies are great at self-moderating if we allow them to. I find it helpful to liken this to work and play. If you were to work all the time, not matter how much you love your work, how would you feel? Likely burnt out, resentful, exhausted and ready for a break. If you were to play all the time, how would you feel? Likely ready for some productivity, organization and a schedule. We all have experience with knowing what we need in that regard. It’s a natural ebb and flow and if we are listening to and meeting our needs, we allow ourselves a balance of productivity and rest. The same could be said for food. Depending on the day, different foods can and will be nourishing and satisfying. That grey area can be uncomfortable, but it allows us to live a much more flexible and nourishing life. I encourage you to think about what you need and trust that it all balances out. TRUST THAT YOUR BODY CAN BE TRUSTED. 3. I do want to make a note that unconditional permission to say yes to food also means unconditional permission to say no. Instead of being in control, aim to be in charge. No food is off limits, and because it’s not, it will be waiting for you when you really want it. Eating in the absence of physical hunger happens occasionally. No big deal. But in general, hunger makes food taste better. You get a lot more enjoyment out of food if you really need it. My favorite quote from Intuitive Eating is: “If you don’t love it, don’t eat it, and if you do love it, savor it.” YOU GET TO OWN YOUR CHOICES. 4. Finally, I encourage you to find alternative coping strategies for dealing with holiday stress other than food. There’s nothing wrong with emotional eating per se, only when it’s our only coping strategy for dealing with difficult emotions. How can you be proactive in taking care of yourself to avoid crisis mode? Do you need to set some boundaries with work or relationships? What about making sleep a priority? Would it help to make a master list of all you would like to accomplish the next few months and allocate time accordingly, so you aren’t trying to do it all at once? What will help you wind down at the end of the day or the end of the week? Do you need to set boundaries for thinking about or talking about food and weight with family and friends? (YES YOU DO) Putting some thought into this will pay dividends. AIM TO BE PROACTIVE RATHER THAN REACTIVE. I wish you the happiest holidays! Such a great post. I love the idea of unconditional permission to say yes also means permission to say no! Sharing on my social ASAP! Thank you Kim! I appreciate that! These concepts helped transform my holidays and all the days several years ago and I’m not looking back! Freedom is where it’s at. I’m a little late to the party but love the way you choose to share all of these tips. Definitely going to share with my clients! Never too late 🙂 Thank you for sharing!